Magnetic wall system especially for facilities. Comes with metal bracket and 5 sleeves with assorted color frames. Desk system especially for facilities. Comes with metal desk stand and 10 sleeves with assorted color frames. Antimicrobial surface-protected wall system, especially for facilities. 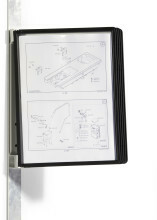 Comes with metal bracket and 10 sleeves with gray frames. Dual-function wall and desk system for portrait or landscape use. System especially for facilities, specifically partition walls and cubicles. Comes with metal partition frame and 10 sleeves with assorted color frames. Wall system with 10 sleeves, part of the award-winning SHERPA® line. Available with assorted or light gray frames. Wall system especially for facilities. Comes with metal bracket and 10 sleeves with assorted color frames.